On August 4th we announced that we had 10,000 registered users. After some internal checks we now realise this was wrong. The reason for the discrepancy was a number of spam accounts. We became aware of these about 6 weeks ago (and introduced a CAPTCHA system to prevent future spam accounts) and have since been tracking down these accounts. We now feel we have a pretty accurate figure for actual accounts and as of now, we have 9,873 registered users. NHS Evidence and non ‘evidence based’ claims! I’ve not mentioned NHS Evidence much and it’s a coincidence that I mention them twice in 6 weeks. I last blogged about them then (click here) to highlight that their searches are massively more expensive than TRIP’s. My interest in NHS Evidence goes back longer than 6 weeks! I have contacts (and had contracts) with the predecessor to NHS Evidence (National Library for Health) and was keen to see how NHS Evidence would change things. Unfortunately, I was disappointed by their lack of ambition and innovation. Although, I’m still hoping to be proved wrong and they’ll do something special – clinicians (and patients) deserve it (especially with their budget of nearly £25 million). It makes me shudder that this got past any internal processes. As a gateway for evidence surely they should be able to substantiate any claims they make. Both claims, to me, were absurd. I could go on, at length, as to why the claims are so foolish and if people are unclear then please contact me separately (jon.brassey@tripdatabase.com) and I’ll explain. After seeing these adverts I felt quite strongly that NHS Evidence shouldn’t make such statements and therefore complained to the Advertising Standards Authority. I recently received a letter telling me that NHS Evidence has confirmed that the advert has been withdrawn and that they will not repeat the claims. But here’s a challenge to NHS Evidence – fund some comparative research and compare yourself to other products. 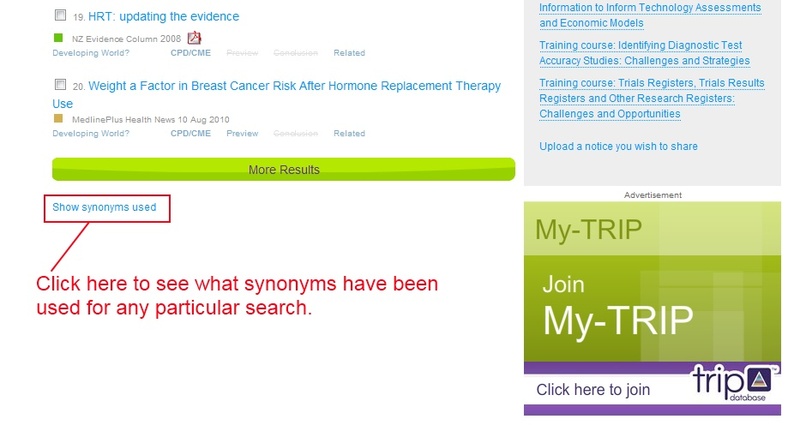 Not just TRIP, but DynaMed, NHS Scotland’s rather nice Knowledge Network and others. Help everyone learn from the strengths and weaknesses of others. If it helps we’ll part-fund it (we’ll give 0.5% of our budget if you match that with 0.5% of your budget). This last quote is quite simply scandalous. I sometimes feel there is a pressure to blog, to write something, just to show people we’re still here and thinking of them! While things may appear quiet (we’ve not blogged, twittered or Facebooked much) we’re still very busy. However, much of the work is behind the scenes as we gear up the development of our TILT project. I’ve been busy finalising the specifications and have as good as signed off on these. TILT is pretty much in stealth mode so what can I say…. While search focuses on known unknowns (you need to know you don’t know something before searching for it) TILT will focus as much on unknown unknowns as known unknowns! When I talk about search, in TILT, I’m not referring to document search – something far more useful and concise. At it’s core is clinical usefulness, it’s a bottom-up approach. Well, I hope that’s whetted people’s appetites. It’ll launch, probably as a beta towards the end of October.